I had my first back to back weekends of flying after completing a flight yesterday. 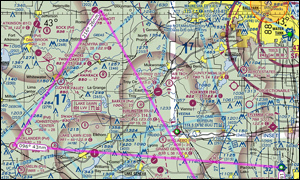 I am working with a CFI to prepare for a Biennial Flight Review either next weekend or the weekend after that. I wanted to take two flights to prepare for the review. In the first flight last week we worked on landings and crosswind landings. On Saturday, I was blessed with a beautiful day to fly. The goal of the flight was to work on maneuvers we did not practice on the first flight last week. Those maneuvers included power-on and -off stalls, 45 degree turns, and emergency procedures. I performed all the maneuvers well except the 45 degree turns to the left which were a little sloppy but improved the more of them I performed. Both emergency landing maneuvers went well with my CFI and I both being confident I could have safely landed on some poor farmer's field had it been necessary. Either next weekend or the weekend after that I will go in for the BFR which will consist of at least one hour of ground verbal review followed by at least an hour of flight review in which I need to perform all maneuvers to test standards. I last successfully performed a BFR in September of 2006. I am looking forward to getting this one behind me. 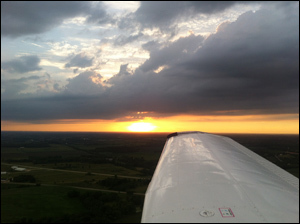 It has been two years and a month since I earned my private pilot's license. As part of the Federal Aviation Administration's regulations, pilots are required to pass a Biennial Flight Review if they wish to serve as pilot in command of an aircraft. I had scheduled my BFR a month earlier but during pre-flight, noticed the airworthiness certificate was missing from the plane. I thought it was the Certified Flight Instructor's way of testing to see if I did a thorough pre-flight inspection. It turned out it was lost and the plane had to be grounded until it was found. It was not found until days later, unfortunately. Happily, this time out to the airport all the paperwork was in order. For a few days leading up to the BFR I reviewed my Sporty's Private Pilot DVDs and the Federal Aviation Regulations/Aeronautical Information Manual (FAR/AIM) book that contains all the regulations that pertain to flying as a private pilot. During the Biennial Flight Review the Certified Flight Instructor does a one hour long verbal flight review that covers regulations and concepts related to flying (e.g., Weights and balances, weather, etc.). My CFI and I spent about an hour and fifteen minutes and for the most part I was able to answer all but a few obscure questions. After the verbal part we went out for the one hour flight review. We departed Sturgeon Bay's Cherryland Airport for one of my favorite airports, Ephraim Airport. I showed my experience with pilotage, flying from one point to another using maps and ground references, to get us to Ephraim. Once there we took advantage of the beautiful turf strip there. I performed short field and soft field take-offs and landings on the turf. I truly love the nostalgic barnstorming feeling of landing on turf runways. After performing some nice crosswind landings we departed and headed back to Sturgeon Bay where we performed a wide variety of maneuvers demonstrated in most Private Pilot Check Rides or insurance check-outs: Turns around a point, stalls, 45&Deg; bank turns, etc. When we got back to Sturgeon Bay I new there would be one more part of the test, a landing with a failed engine. Sure enough as I entered the pattern to land at Cherryland Airport my CFI announced my engine had failed and pulled the power out to simulate an engine failure. I cut the pattern short to ensure we would make the runway and brought the airplane down gently. Upon completing the landing I was informed I had passed my Biennial Flight Review.